Former Syrian secret intelligence agent Mohammad Zaheer Al-Sadiq – the main witness in the assassination case of martyr Rafiq Al-Hariri — has linked members of Hezbollah to the crime, while reaffirming the truthfulness of his confession to the Special Tribunal for Lebanon. Talking to Al-Seyassah daily from one of the European countries where he is currently residing after leaving United Arab Emirates, Al-Sadiq said those behind the crime will tremble in fear after the issuance of an earth-shattering decision by the tribunal. He confirmed the logistical involvement of Hezbollah members in the assassination of Al-Hariri, but he does not know whether the Hezbollah leadership was aware of the group’s role in this crime. Expressing surprise at the recent statement of Hezbollah General Secretary Hassan Nasrallah on the so-called ‘false witness’ prior to the issuance of the decision, Al-Sadiq stressed if Nasrallah is contemplating on the repetition of the May 7 tragedy, he is wrong because nobody can terrorize the court. He was referring to the attack on Beirut in May 2008. Comparing some Hezbollah politicians to the gangs in Chicago, Al-Sadiq believes that resistance is more honorable than taking care of these people. He revealed during the Syrian rule in Lebanon every major and minor security operation took place due to the strong coordination between Hezbollah and the Syrian leadership, through the Syrian military intelligence. 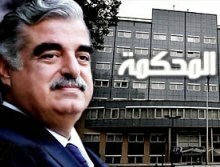 Al-Sadiq expects Public Prosecutor at the International Court Daniel Bellemare to issue a decision stronger than the ‘tremor’ caused by the assassination of Al-Hariri in the next few months and those involved in the crime have started trembling in fear. He advised those who raised doubts on the court, especially Lebanon, to wait for this decision as it will be supported by incriminating evidence. Repeating his previous accusations against the Damascus regime and Syrian-Lebanese security group that ruled in 2005, Al-Sadiq claimed the Damascus regime and former Lebanese President Emile Lahoud had given the order to kill. He added four generals and a number of Lebanese and Syrian politicians are also involved, indicating the court will not sympathize with these criminals. On reports that Syria and Hezbollah have been putting pressure on Progressive Socialist Party leader MP Walid Jumblatt to withdraw his testimony on the involvement of the Damascus regime, Al-Sadiq affirmed the testimony has been recorded and documented, and these people cannot do anything even if Jumblatt recants his statement. He argued Jumblatt is well-versed in politics, so he restored his relations with the Damascus regime because he knows the coming days are full of surprises. While describing former Lebanese minister Wiam Wahhab as a henchman and parrot, Al-Sadiq admitted he has refused to respond to former director-general of Public Security Major General Jameel Al-Sayed who had earlier threatened to sue him for perjury. He asserted the latter is a criminal, killer, and thief, asserting Al-Sayed’s bank statements are enough proof. He added Al-Sayed is out of prison not because he is innocent but he is on bail. Stressing he is the main witness in the Al-Hariri case, Al-Sadiq clarified there are a number of other witnesses but he is the one who provided most of the information. “I said the suicide bomber was not Ahmed Abu Adas and the car used in the operation was Mitsubishi. I discovered the tape, which included an image of the car and telephones at the crime scene,” he added. Al-Sadiq confessed he entered the United Arab Emirates using a Czech passport but he was not aware that the document had been forged. He said he obtained the passport from the office of French President Nicolas Sarkozy when the latter was still minister of interior. He stated he reserved his right to sue the official who issued the passport in a French court as the UAE authorities rejected the Syrian judiciary’s call to deport him. He explained the UAE does not hand over any suspect without evidence to support a deportation request.